BG Nexus Storm WP22 IP66 2Gang Weatherproof. The BG Nexus Storm WP22 Weatherproof Socket comprises a robust polycarbonate enclosure with durable integrated 2 gang Switched Sockets. IP66 Rated with plug in use, cover sealed. Spike for fixing in ground. 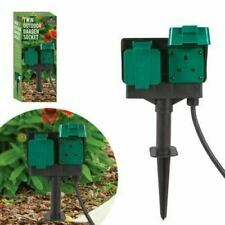 TWIN OUTDOOR GARDEN SOCKET. 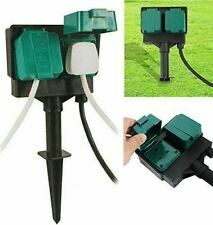 Below are the features for Twin Outdoor Garden Socket. 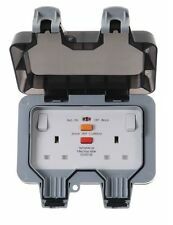 Product should be plugged into a mains indoor socket or a waterproof outdoor socket with a residual current device. BG Nexus WP22RCD IP66 2Gang Weatherproof. 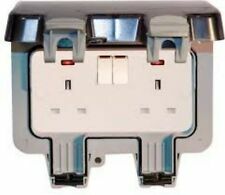 WP22RCD 2 gang 13 amp double pole RCD protected switched socket. The Weatherproof RCD Socket comprises a robust polycarbonate enclosure with an integrated 2 gang RCD protected Switched Socket. Waterproof Outdoor 13A 2Gang Storm Switched Socket Double IP66 Outside. Weatherproof Outdoor Twin Switched Socket. 2 Gang (Twin). Switched Sockets. Secure, Easy To Open, Lid Catch That Provides An Excellent Secure Water Seal When Closed. Channel Islands, Isle of Man, Isle of Scilly, Isle of Wight, Scottish Isles, Scottish Highlands and N.Ireland, Republic of Ireland. Spike for fixing in ground. Product should be plugged into a mains indoor socket or a waterproof outdoor socket with a residual current device. BG Nexus Storm WP22 IP66 2Gang Weatherproof Outdoor Switched Socket 13A. The BG Nexus Storm WP22 Weatherproof Socket comprises a robust polycarbonate enclosure with durable integrated 2 gang Switched Sockets. BG Nexus WP22RCD IP66 2Gang Weatherproof Outdoor Switched Socket 13A. IP66 Rated with plug in use, cover sealed. Supplied with multiple knock-out mounting box. 30 mA trip current, 40ms trip speed. RCD sockets manufactured to BS 7288. Masterplug Outdoor Power Splashproof Housing for Single Socket Connection. Suitable for use with garden and household power tools. Use 3 core round flexible cables only. Protects power connections indoors and outdoors. 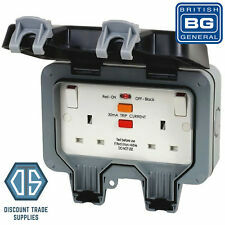 2 GANG BG ELECTRICAL STORM OUTDOOR SOCKET. Cover will stay open to allow for easy access to sockets. Housing will accept accessories from the Nexus range. IP68 16A Plug and Socket Cable Connector (3 Pole). 16A, 3 pole, IP68 cable connector at 2 bar. IP68 to 1.4Mtrs CE, EN 62444:2013. M22 size cable glands. Security &. and service?. GRIP IT Fixings GASSORTKIT Heavy Duty Plasterboard Assorted Kit Contains 32 Pce (#182195472223). Waterproof Outdoor 13A 2 Gang RCD Switched Socket Double IP66 Outside. RCD Protection. Weatherproof Outdoor Twin Switched Socket. 2 Gang (Twin). Switched Sockets. Secure, Easy To Open, Lid Catch That Provides An Excellent Secure Water Seal When Closed. 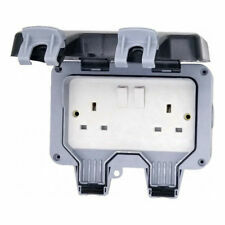 2 Sockets With Covers, Long 5m Cable, CE/GS Approved!! IP66 Water & Dust Protection. Weatherproof and dust-tight 13A socket. Manufactured from robust, impact-resistant polycarbonate with multiple gland entry positions. Double pole switching. Hinged, Stay Open Cover. 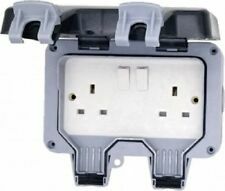 Specification: 2 gang double pole switched socket. The Masterplug SPTO is a splash-proof housing for a single electrical socket which has single cable entry and exit points. It is intended to be used only with a single-socket extension lead. You have a safe and convenient peanut shaped housing for providing electrical power to outdoor appliances such as garden lighting, power tools, water features and Christmas decorations. Outdoor Socket Set. Provides power to your garden safely. Baby & Toddler. Curtain Wire. Party, Wedding & Occasions. Party Balloons & Decorations. Garden & Outdoor. Party Candles. (IP66 2 Gang Weatherproof Outdoor Switched Socket - WP22. IP66 Rated. 3) Isle of Wight - PO30 - PO41. 2 Gang Twin Socket. Weather and dust proof. Hinged cover has simple press to open or press to close operation. Waterproof: IP55. Rated IP55 when NOT in use. Care should be taken not to overload. Plug: Standard UK 13A. 1 x Waterproof socket. Polycarbonate Socket Box is Dustproof & Corrosion Resistant. 1 x Waterproof Connect. The 13 amp Switch Socket is IP66 rated for protection against water ingress. It has a robust, high impact UV stable switch housing for protection and safety. Robust, high impact UV stable socket housing. IP54 Rated. WEATHERPROOF 13A DOUBLE OUTDOOR SOCKET. IP stands for "Ingress Protection". The IP is normally followed by 2 numbers. The first number indicates the level of protection the enclosure provides against access to hazardous parts and the ingress of solid foreign bodies. IP66 rated for superior weather resistance. UV protected against fading. nd Class signed for. Neutral modern design suitable for most locations. Masterplug Splashproof Plug & One Gang Socket Cover. The Masterplug SPTO is a water resistant splash-proof housing for a single electrical socket which has single cable entry and exit points. You have a safe and convenient peanut shaped housing for providing electrical power to outdoor appliances such as garden lighting, power tools, water features and Christmas decorations. 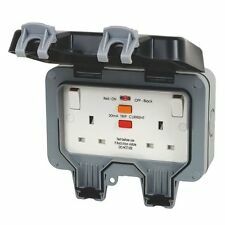 2 Sockets With Covers & 24 Hour Timer, Long 5m Cable!!! Outdoor Socket Set. Provides power to your garden safely. Waterproof Outdoor 13A 1 Gang Switched Socket Single IP66 Outside. Weatherproof Outdoor Twin Switched Socket. 1 Gang (Single). Switched Socket. Secure, Easy To Open, Lid Catch That Provides An Excellent Secure Water Seal When Closed. (3) Isle of Wight - PO30 - PO41. 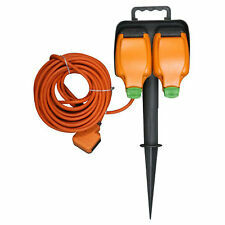 Masterplug Weatherproof Garden Outdoor Spike. Tapered spike to fix in to the ground or the spike can be unscrewed if you wish. 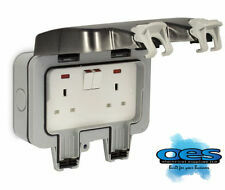 Two dust and splash proof sockets designed for outdoor use. Inside a strong IP56 enclosure. IP56 Dust and weather reisistant. Ideal for garden use, outdoors use, areas where the socket may need protection from diust and water spray like in a warehouse or working areas. 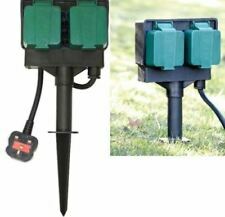 Masterplug 15M Weatherproof Spike with 2 Sockets Outdoor Tools. Two dust and splash-proof IP54 rated sockets with safety covers. Tapered 'spike' to easily fix into the ground. Ideal for garden power tools or lighting. IP66 Rated with plug in use, cover sealed. 13A socket manufactured to BS 1363-2. Switched sockets with power indicator. Double Pole. Cables & Accessories. (IP66 1 Gang Weatherproof Outdoor Switched Socket - WP21. IP66 Rated. 3) Isle of Wight - PO30 - PO41. 1 Gang Single Socket. Hinged cover has simple press to open or press to close operation. Weather and dust proof. Switched sockets with power indicator. WP23L- Adjustable socket position - top, middle, bottom. RCD not included. Long lasting, will not crack or fade. High impact resistance. We endeavor to provide the best service possible. Lid Will Close OverStandard 13A Plug Top Keeping Item IP65 Rated When in Use. WEATHERPROOF SINGLE SWITCHED SOCKET. Light Grey Enclosure with Snap Locking Lid. 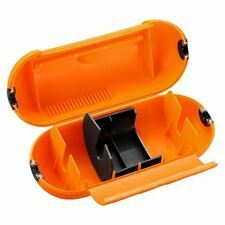 Polycarbonate Socket Box is Dustproof & Corrosion Resistant.